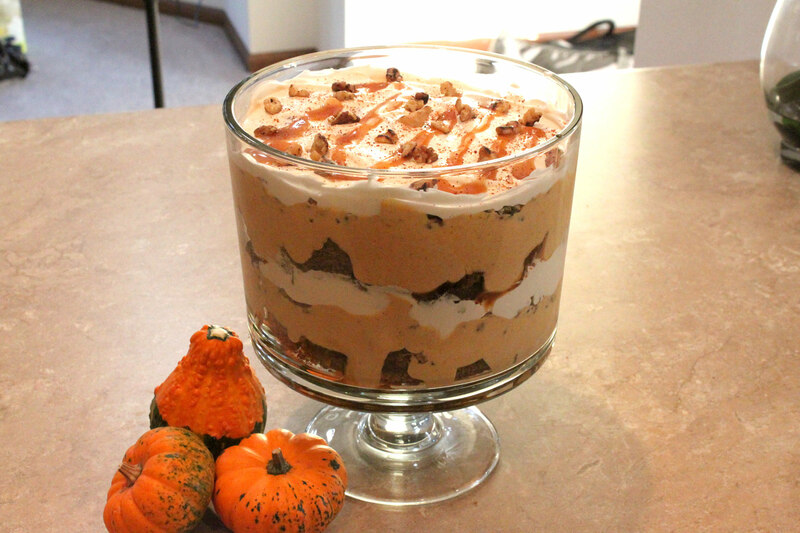 Pumpkin Trifle | And sometimes I cook. Set aside 1/4 cup of crumbs for topping. Divide remaining crumbs into 4 portions. Sprinkle 1 portion into the bottom of a glass trifle bowl (or 3 quart serving bowl). In a large mixing bowl combine pumpkin, spices, milk, and pudding mix. Spoon 1/2 into the serving bowl and sprinkle with the second portion of crumbs. Whip cream until stiff (my mother-in-law added a little sugar & vanilla to the whipped cream) & spoon 1/2 into bowl. Sprinkle with third portion of crumbs and top with remaining pumpkin mixture and the last portion of crumbs. Top with remaining whipped cream. Sprinkle with reserved 1/4 cup crumbs.